Satisfied customers, that’s our goal! Find out where you can find us! Imagine the scenario: an attractive, modern building is ready for handover, but a leak is suddenly discovered in the roof…. Why did I choose Cibor to repair a drain pipe? The Cibor group offers a full package of services for resolving issues encountered in and around buildings. 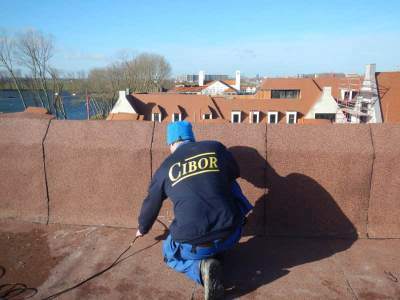 The services provided by the Cibor group are divided into four domains: leak detection, building pathology, special repair techniques and concrete processing: drilling, sawing or sanding. Cibor has also had an SCC-certified safety system for many years. Cibor understands like none other that problems in and around buildings can cause you a great deal of stress. Not to mention the damage you suffer or the costs you incur. Cibor promises to relieve this stress in the best possible manner. How do we do that? Cibor always responds with the same speed, meticulousness and professionalism, whether you have a gas, water or fuel leak, an odour-related issue, draught problems, a broken drain, problems involving heavy-load anchorage, holes in concrete, etc. Are you an insurance professional, syndicate, private individual, company, contractor, roofer or loss adjuster? We are the people to contact for a fast and reliable solution to your problem. Cibor has many experienced and technically skilled professionals on its books. Our research department enables us to first thoroughly analyse problems before developing a solution that perfectly meets your needs. How do we go about things? We have the issue studied by a team of experts, each with their own expertise. Once all aspects of the problem have been identified, we draw up plans and make initial preparations. Our back office follows the whole process from A to Z, so pre-agreed planning is always respected. Are you an insurance professional, property management agency, private individual, company, contractor or roofer? Then you have found the right address for a fast and reliable solution to your problem. Cibor, the specialist in the field of leak detection, is your guarantee for a fast and high-quality intervention. We detect leaks in water- and gas pipes and do this without having to perform any removal work. For this, we use no less than 13 different innovative techniques, ranging from thermography, endoscopy, moisture mapping, and acoustics, to tracer technology. Cibor established the building pathology branch because not all water damage in buildings is due to leaks in water-bearing pipes, but often also have a structural cause. 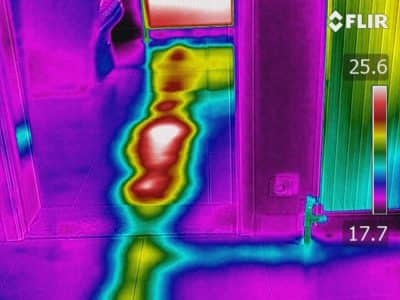 With the help of all kinds of innovative techniques, including infrared thermography, Inductive Impulse Current Procedure, high-frequency techniques, data loggers, etc. ), we locate, mainly in a non-destructive manner defects in the building shell like in the roof and facade that cause the water damage. Leaks usually prove to be very expensive: loss of water or fuel, environmental damage… Opening up your floor, pipe system or roof is often a real nightmare. Cibor is a reliable partner for contractors and industrial companies for a wide range of concrete machining. Regardless of whether this relates to concrete drilling, sawing, anchoring, grinding or milling, or to the repair of concrete- or asphalt floors: our customers trust Cibor because of our professionalism, our qualitative finish and our customer focus. I would like to receive updates and information from the Cibor Group. Yes, Cibor may process my data and send me information which, based on the processed data, could be of interest to me.